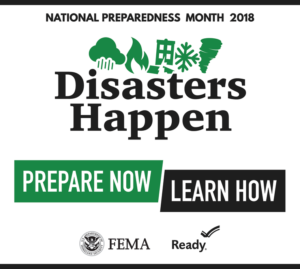 GRAFENWOEHR, Germany — Each September, the United States and now many other countries, recognize National Preparedness Month. You are probably thinking, I don’t live in an area prone to disasters. Why is this important? Why and better yet, for what do I need to prepare? In 2017 alone, there were 330 disasters, not including emergency incidents, which cost thousands of individuals their lives, their homes and everything they know. These 330 declared disasters resulted in an economic loss of more than $306 billion with more than $1.4 trillion in damage over the past 10 years. Those numbers are too substantial to turn a blind eye and pretend it will not one day affect you or someone you love. This is why NPM is so important and why we all should make an attempt to participate. If not for ourselves, then for the safety and well-being of our families. The International Federation of the Red Cross estimates that for every dollar spent on disaster preparedness, an average of four dollars is saved on disaster response and recovery. We will all face crisis moments in our lives and we want you to consider each of these tasks and evaluate your own personal readiness. These tasks will help you acquire the skills and knowledge necessary to face any crisis situation well prepared and head on. The thought of emergency preparedness can be quite daunting, especially if budgets are tight, you move a lot or do not even know what hazards plague your area. That is why USAG Bavaria adopted the 30 Days, 30 Ways Preparedness Challenge: a month long challenge that presents a simple preparedness task that you can complete during the month of September. This challenge originated in 2010 in Washington State as the brain child of the Clark Regional Emergency Services Agency. Now on its eighth year, the agency continues to have success with this challenge, not only in participation and reaching the masses, but also in saving the taxpayers thousands of dollars in disaster response and recovery through educating and fostering self-responsibility when it comes to emergency preparedness. Here in beautiful Bavaria, we will begin not only our first ever month long preparedness challenge, but also the first ever in the Army. Anyone can play! All are invited to join in the preparedness madness! Because we know everyone is busy, you will have all month to complete the challenges, all challenges due by midnight of 30 September 2018. Even though you have all month, we will still select a Daily Winner from entries that come in by midnight of the corresponding day. Send responses to 30days30waysUSAGBavaria@gmail.com. Be sure to include the Challenge Title, all your responses and the names of your Preparedness Battle Buddies. Video entries should be 30 seconds to one minute ideally, but no longer than three minutes. We are providing a way for our more knowledgeable players or anyone that wants an extra challenge to take the daily challenge to the next level. These extra challenges are still associated with the daily task of the day, but usually require a bit more time to answer. The same rules for the daily challenges also apply to the Bonus Challenges. All answers should be submitted by 30 September 2018! We want to encourage and reward you even more for encouraging others to take the challenge with you! In fact, the more people you get to complete each challenge, the more points you will be rewarded. That’s right. The more folks you get to complete each daily challenge the more points you can earn … double, triple, quadruple points for each day! Include your Preparedness Battle Buddies’ names in each of your daily submissions. How and What Will I Win? A winner will be chosen for each challenge following the day of each closed task. Judging is based on the relevancy to challenge of the day, creativity and importance of the message. At the end of the 30 days, the top three participants will be announced and recognized by the Garrison.